This Fall The 13th Marine Expeditionary Unit will become the first West Coast MEU to deploy with the Osprey. 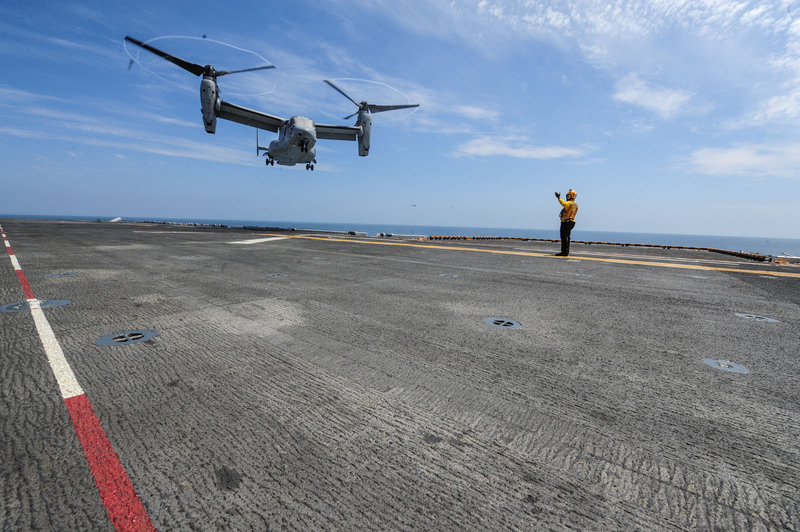 Set for a pump through the Asia-Pacific region, the 13th MEU will depart with a compliment of 12 MV-22 Ospreys aboard the amphibious assault ship Boxer, according to a Navy news release. The aircraft will be piloted and maintained by Medium Tiltrotor Squadron 166 out of Marine Corps Air Station Miramar, Calif. While the 13th MEU is not the first to have ever deployed with the Osprey, it is the first that will take it afloat in the Pacific — the Marine Corps’ expected area of focus after Afghanistan. In 2009, Ospreys deployed in the Atlantic with the East Coast-based 22nd MEU. Marine leaders have pitched the Osprey as a fast, long-range aircraft that can both rescue downed pilots or troops far behind enemy lines — as it did in Libya in 2011 — or be used in an invasion to circumvent fortified beaches. That could allow Marines to attack enemy fortification from the rear, avoiding necessary casualties before establishing beach heads for logistics support. The 13th MEU is expected to complete their certification exercise off the coast of southern California Wednesday. It is the final milestone before receiving the all-clear for deployment.